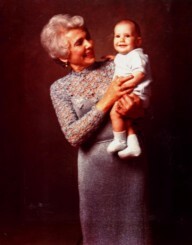 Toby & her grandson, Dani Goldstein, as an infant (ABT 1973). 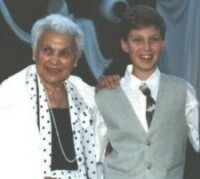 Toby & Haim Krolik at Benji's Bar Mitzva (summer 1995). Toby & Haim (Linz 1947). (L to R) Ilana Ohayan, Joel Krolik, Haim Altmark, Toby, Rachelle Krolik, Tzippi Altmark (summer 1995). Tillie Wiernik Trager, Toby, Norman Trager, Keah Krolik Goldstein in Washington. Toby & Haim with the Goldsteins at Benji's Bar Mitzva (summer 1995). (Back row)Dani, Leah, Benji, Ellie, Michael. (Front row) Haim & Toby). Tillie Trager, Leah & Toby in Washington. On Wednesday, February 25th, my grandmother, Toby Krolik, stopped breathing. The loss of a loved one never comes easy, and I miss my grandmother greatly. But I did not lose my grandmother last Wednesday. Life is not a mere chemical process. In this age of modern technology, the heart can go on beating almost indefinitely. Yet, to live requires the ability to think, to feel emotion, and to be able to appreciate, if not interact with, the world around you. What, lay in Bobie Toby’s hospital bed last Wednesday morning was not my grandmother as I knew her. It was but a mere shell of the woman I once knew and loved. Admittedly, that shell brought me some comfort, for it served to remind me of the physically strong, petite woman with the white hair and brown eyes whose love for me was boundless. A memento, which conjured memories of those special grandson/grandmother moments we shared throughout my childhood and adolescence. Memories which were her most cherished treasures. Memories of the way she used to shlep me up and down her street on my little wooden sled. Memories of the year she took me on the March to Jerusalem. I was maybe 5 years old at the time. We got started relatively late, and my legs only carried me so quickly. So, very early on we found ourselves on our own, well behind all the other marchers. The ascent up Mount Royal proved too much for me. Exhausted, I began to cry. I cried because I was 5 years old, and I wanted so desperately to complete the march. So, my grandmother, moved by my tears, and not wanting to disappoint me, picked me up, called me “her little sac of potatoes” and started to carry me up the steep slope of Mt. Royal, until she too grew too tired to continue, and was forced to accept a lift. Memories, like our outings to botanical gardens, Beaver Lake, Place-des-Arts, and the Shreiner’s circus. Memories of her Friday night dinners. She might not have been the most talented of cooks, yet she made a fricassee and tongue in tomato sauce beyond compare. Overcooking her fricassee and tongue somehow made them better. The whole family would look forward to those dishes, and nothing brought her more pleasure than watching us enjoy her cooking. She never ever sat down to eat with us. Preferring instead to serve, in order to make sure that everyone else had enough to eat. Memories of the French toast and fresh orange she served me whenever I slept over. French toast was another thing she cooked well, and it made up for the bath that would go along with it. Oh, how she loved bathing me. But oh, how I hated being bathed. Memories of the hours she would spend recounting her life’s story to me. A story of a poor orphan girl who never had a real family, and was forced to fend for herself from a young age. A story of a young woman of 24, who was forced to leave her native Poland to save her life. She spent the war years in a Siberian forced-labour camp, while most of the people and places she knew and loved were burnt to ash. As a child, her story intrigued me. Parts of it saddened me, especially the part when she lost the only known picture of her father when she was robbed on a train in Siberia. Part of her story frightened me. The part about her escape from the Nazis. I was only a child and I didn’t understand that the Nazis were not going to come and kill me in Canada in the 1970s. When I grew a little older, and began to understand, the fears subsided. When I grew older still, and understood a little better, the fears returned. Memories of her trip to Israel. She packed her two suitcases full of presents for my family. As a matter of fact, she packed them so full of presents that she didn’t leave any room for her clothes, and came to Israel with only the bare minimum. On that trip, we saw all of Jerusalem together, by bus of course. (Taxis were reserved for crises.) She absolutely insisted that we visit Yad Vashem, Israel’s Holocaust museum, together. It was just prior to my trip to her native Poland on the March of the Living. In the museum she found a map of Warsaw on display. She pointed out the street in which she used to live. “Zamenhof 24,” she said to me. “That’s where I used to live. I want you should go there when you’re in Warsaw.” I took a look at the map. It was a map of the Warsaw Ghetto denoting various landmarks. There was a landmark on her street, right across from her building, at Zamenhof 19. It was the Judenrat. I went to Poland. Her street wasn’t there. A new street, also named Zamenhof, had been built in its place. She didn’t know, or didn’t want to know, that they had burnt the street when they burnt the people. I didn’t want to, or couldn’t bring myself, to tell her. Instead, I took a picture of the street sign corner Mila Street. Then one day, Bobie Toby got sick. It was painful for all that loved her to see her memory slowly fading away. It started with minor absent-mindedness. She would forget where she placed things, or ask a question, forget having asked it, and repeat the same question two minutes later. Then she began forgetting names and major details from her day. I would visit her one-day, return the next, only to be asked why I hadn’t visited her in so long. At first my grandmother realised that her memory was slowly deteriorating and was very disturbed by this. But even when sick, my grandmother and I continued to have special moments. At one point she became so forgetful, that she forgot that she was forgetful. In this phase I noticed a certain joie de vivre that I had never before seen in her. She began to embrace life with a child’s enthusiasm. She was intrigued by the world around her, though unable to make head or tail of it. Life’s smallest pleasures began to excite her. All it took was a little attention, a warm smile, a flower, to make her day. I remember how on one occasion someone brought her a rose. She insisted on showing it to all the nurses who passed by. You could tell from the smile on her face and the cheeriness in her voice how delighted she was. No, this was not the Bobie Toby who used to schlep me up and down Kent Avenue on my sled… But she still loved me, I loved her, and she was happy, so I was too. The last few months were a difficult period. This is not how I want to remember Bobie Toby, nor how she would want to be remembered. I’d much rather remember the unconditional love and compassion Bobie Toby showed me, my parents, Michael and Leah, my Uncle Leon and Auntie Honey, my cousins Daniel, Jesse and Loren, and my sister and brother, Ellie and Benji. Circumstance did not allow my father and siblings to be here today, but they too feel the loss and are with us in spirit. I am thankful that my grandmother got to watch her children and grandchildren grow up. That she was able to celebrate and shep a little naches. I am thankful that her final days were peaceful. I am thankful for all the special memories my cousins, my siblings and I shared with her. And I am thankful for the fact that she gave us all reason to miss her. Bobie, though over the last number of years we lost an important part of you, I am thankful that part of you will live on in us forever. Before I finish, there are just a few people I would like to thank. Over the past number of years, many of you have proven yourselves loyal friends to me, my grandmother and my family, by helping us through our difficult time with innumerable acts of generosity and kindness. There are three people, whose extraordinary efforts I want to mention. Ben Sandler. As my grandparents’ situation deteriorated and they became less capable of coping on there own, you were always there for them, quietly helping out behind the scenes, and rarely receiving any thanks in return. When my grandfather needed to be taken to the bank, you would take him. When my grandparents needed a loaf of bread, or a bag of milk, you ran out and bought it for them. When their TV broke, you took it and had it repaired, without their asking. You were a loyal friend to them in times of health, but you proved just how loyal you were when they grew sick. The same goes for Manya Kantarovitch. I learnt of your from the whitefish I once found my grandmother eating, which she said, you had prepared for her. And from my grandmother’s frequent mention of your visits as the highlight of her week. And from the times I would call my grandmother and you would answer the phone. And from the groceries in my grandmother’s fridge that Bobie Toby said you had purchased. Manya…, thank you. One last ‘thank you’. One day I got a phone call informing me that my grandmother was in the hospital. I immediately rushed down there to keep her company. Once there, I felt I should call and inform someone of this. Leon was out of town at the time. But I didn’t need to think twice about whom to call. I picked up the phone, and called Shirley Gonshor. 20 minutes later Shirley was in the hospital, with two bags full of prepared food. She spent the day there with my grandmother and me. The food in the bags was for my grandfather. She was worried that he would have nothing to eat while home alone, so, when she was done at the hospital, she went and delivered him a care package. As unique a gesture as this may seem, these acts tend to be the norm with Shirley. 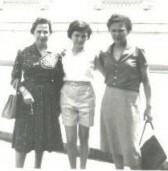 In my two and half years in Canada, Shirley Gonshor was always there for my grandmother and me. Not a week went by without a phone call from Shirley, inquiring as to my grandmother’s situation, and asking if she needed anything. At times, she helped out with my knowledge. At other times, the only evidence of her presence were tins of food in my grandparents’ fridge, labelled with words like “kasha”, “rice” “roast beef” or “meatballs”, in her handwriting. Shirley couldn’t be here today. Nevertheless, knowing Shirley, she is still bothered by the fact that she isn’t here in Montreal, with us right now. But caring for the living is a much greater, and more difficult, mitzvah than caring for the dead. Shirley was here for us in our REAL time of need. My mother-in-law did not have an easy life. Her father, Leib, was not a young man when she was born, almost sixty-five. He was a religious man (I believe a Gherer Hassid). He spent his time studying and not dealing with the practicalities of daily life.. When Toby was three years old, her mother passed away and she was sent to live with relatives. At the age of twelve, she lost her father. Toby moved from her small town of Pultusk to Warsaw where she worked as a seamstress. She became involved in the political movements of the day, believing in causes that she felt would better the world. On more than one occasion she was nearly arrested for some of her social action activities. The Second World War came and after the first bombings she fled Warsaw and ended up in the labour camps of the Soviet Gulag where she spent the remaining war years chopping trees and doing other hard physical labour. After the war Toby ended up in the displaced persons camp in Veksheit/Bindermichel, near Lindz Austria where she met and married Chaim who himself had suffered his tragedies. They married and shortly thereafter, Leah was born. The three of them moved to Canada when Leah was still an infant. Canada was not supposed to be their original destination, for Chaim was a "farbrenter Tzionist". My mother-in-law, however, took the practical approach. Tired, after a difficult childhood, nearly 10 years of war and living in DP camps, she felt that going to the not yet established State to more war and rationing of food was more than she could bear. Her own childhood was largely without parents so Toby revolved her life around her husband, children and grandchildren, giving them the kind of parenting she so sadly lacked. She was always concerned with their well being and comfort. If one did not know from whence she came you could say that she was overly concerned. She loved them dearly and any overprotecting, smothering or seeking to ensure her love for them was an honest effort to have them achieve in life what she could not. It was her belief that it was important to be a part of a "gezelshaft" - to be a part of a social group that also had an ideological commitment and an intellectual basis that drove her to push Leah and Leon to attend Habonim. Her grandchildren were her precious jewels. Until the last couple of years she would never forget a birthday, anniversary or other joyous occasion -- so great was her desire to make sure that the occasion was marked that her cards and gifts would often arrive well before their due date. Having her children and grandchildren with her on Friday nights, holidays and other occasions was of paramount importance to her. Up until we left for Israel, we would have Shabbat dinner at her home at least twice a month. After we left, Leon and Honey continued the tradition. It was during those times that she converted my taste buds from liking Ukrainian gefilte fish to loving her Polish gefilte fish that was so sweet. I even abandoned my floating kneidlech for her Polish sinkers. 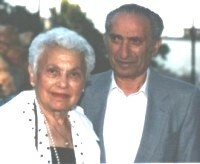 Her primary task, as I remember during the thirty-two years that I knew her, was taking care of Chaim. She had to prepare his meals and insisted on also being there to serve them. On the rare occasions when she went out, she became very anxious around meal times, worrying about how Chaim was "giving himself an etzeh". Toby was interested in arts and culture and living near the Jewish Public Library was a great joy to her. She would always run to lectures. She was an avid reader of Yiddish books and newspapers. If I have sadness about my mother-in-law it is that the path of her life prevented her from fulfilling many of her own needs and dreams. Often, if we came into the house unexpectedly, we would find her asleep on the couch, in a sitting position, reading a book. Invariably, she would not “fargin zich" this pleasure until all her chores were done and by then fatigue had set in. In the early, very difficult years in Montreal, she fought to ensure that her children received a serious Jewish education. To her this meant day school at the Peretz Shule. An afternoon school education, as was the norm in those days, was not enough of a commitment in her eyes. This meant doing without many things in the days when there was precious little to start with. She also understood that academic studies alone were not enough and continued to do without so that Leah could attend both piano and ballet lessons. Leon, being the boy, had to make do with only piano. She encouraged those around her to get enjoyment out of life and was happy if she heard the children took vacations or attended the theatre or a movie. She however was always reticent about taking these pleasures for herself. She also worried about her friends. If there was a function she and Chaim were attending, she worried about how everyone was getting there. They were the first car owners among their friends and she made sure that anyone who needed a lift was ferried to and from home. And what is it that she often ferried them to? It was as often as not meetings and functions of the "Varshiver Society". The Lanzmanshaft of all those from Warsaw and environs who like her were rudely separated from the city of their youth, families and ancestors. In true Toby fashion, she was not the President of the Varshiver but the hard worker who would think nothing of going out for hours and days, collecting donations for their annual bazaar. The proceeds were then donated to help rebuild the State of Israel. I admit that I sometimes ridiculed these activities and the entire notion of the Varshiver. Only recently, particularly as I got involved in family genealogy, have I come to understand, how important such groups are to people who share a past of places far away and in particular a past and location to which history has ensured that you can't return. We cannot undo the past. We cannot even imagine how different Tobshe would have been had she not suffered both personal tragedy and the tragedy of the Holocaust. She could not and did not think of herself.. She never put her needs first and could not fully overcome her past to truly enjoy what she had. She felt her orphanhood every day of her life and spent her life trying to fill the emptiness by loving those around her unconditionally – her husband, children, grandchildren and friends and we all truly and deeply loved her. Friends, we are gathered her today to mourn the loss, and honor the life of Toby Krolik, Toby Bajla, bat Lev and Leah z"l, a devoted wife to Haim for over 51 years, a beloved mother to Leah and Michael, to Leon and Honey, a loving Bobbie of Dan, and Ellie, and Benji, Daniel, Jesse and Loren. Every person has many different facets to their life, but Tobje, as she was known to her friends, was a woman of many paradoxes. Though diminutive in size she was powerfully strong and had a mighty grip. And what she lacked in physical strength she made up for in sheer willpower and determination. She survived a difficult childhood and the trauma of dislocation and loss during the war. And yet she could never adjust to the ease and luxuries of Canada. She never allowed herself the better things in life, but she made sure that her children learnt to enjoy and to experience the best and the highest quality of life, and to strive to the highest standards in life. The better part of her life was spent trying to create what she was never able to experience in her life, neither in Europe or here in Canada, the feeling of a safe haven. 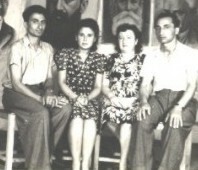 Together with Haim she devoted herself to Leah and Leon, making sure that they had a proper Jewish education, the right cultural and social experiences. But if she created a home, a loving home, it was not so much for herself as much as for others. And I was reminded of the verse we read in shul this week regarding the creation of the mishkan of which it is said "Ve asoo lee mikdash ve shahanty betoham - let them make me a sacred space and I will dwell amongst them". G-d didn't need a place for himself as it were to dwell; G-d wanted a place for the children of Israel to gather together. And in their hearts, and in their holy deeds which they preformed, and in their memory of G-d, G-d dwelled. This in some way was the way Tobtche Krolik lived her life, concerned that others would find a place to be safe, that others would find a place to find their fulfillment, and that she would rest amongst them. It's somehow fitting for this woman who never allowed her self to be comfortable anywhere in the world, that her grandson Benji, thought of sending a jar of earth from Jerusalem for her to be buried with that piece of earth.